For this event we will be be offering an opportunity to look at the games and toys of the 17th century, as well as some of the mathematical and numerical skills developed in the period. Lodge Park is a National Trust property on the Oxfordshire/Gloucesteshire border. 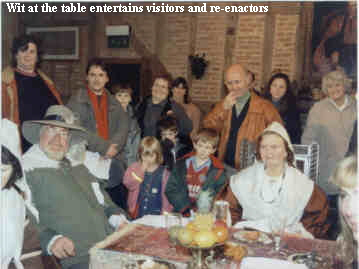 The Household is a group of re-enactors who come together to provide live 17th-century history events in mainly domestic situations. We specialise in turning 16th- or 17th- century houses into living homes, with a family, household retainers, guests and visiting traders. We believe that no other groups of our size can offer the range and originality of what we can bring to an event. We pioneered several areas of 17th-century reenactment and remain the only users of a Pascaline in the UK - see What we Do - Reckoning. Enter the site by clicking on one of the buttons alongside. Move around the site by using the side buttons or the "Back" key on your navigator toolbar.